Happy September everyone! While out walking my dog this morning it was nice and cool. It made me realize that autumn is fast approaching (where has the year gone?). While I long for the cool breeze and the change of colors in the trees I am already missing summers longer days. More daylight to get things done or nothing done at all. Today I was reminded to be in the moment. Today as usual I had a running list of “to dos” in my head (sound familiar?). I may be driving, listening to the radio, walking my dog and suddenly realize that I am not “in the moment”, I’m running through that list in my head. I don’t mind so much when I am driving( I get a lot of things worked out while in my mobile office), but when I am with my dog Cole I do so want to be in that moment. As many of you have experienced, our beloved pets are on this earth for such a short time. Being in this business I’ve had my share of enduring the passing of more pets than I care to think about. So I am acutely aware that my time with Cole is limited. Some tell me not to think about it, but I do think about it and often. The positive side of it is that it keeps me mindful to not to take for granted the time we do have together. But sometimes regular life still gets in the way. So today when you are with your family members (four legged or two legged) I encourage you to remember…Life is short, take time to slow down and be in the moment! 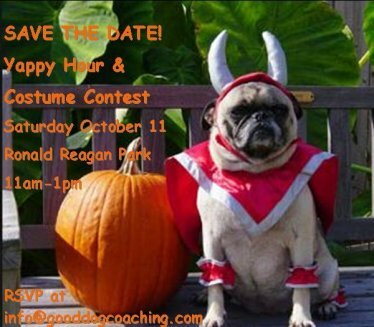 Save the Date for Yappy Hour! Why are Your Dogs Susceptible to Them? With nearly 2,000 species and subspecies, fleas thrive in warm, humid environments, and feed on the blood of their hosts. Dogs play host to the cat flea (Ctenocephalides felis), whose dark brown or black body is usually one to three millimeters in length. Why Are Dogs Susceptible to these tiny creatures? Hearty, nimble and searching for a host, these little guys can jump 10,000 times in a row (the length of three football fields). Three pairs of legs make for excellent leaping capabilities (up to two feet), and a laterally flattened body allows for quick movement in a dog’s fur. Watch our new dog training video! Whether house training a new puppy or an adult dog the process is much the same. Here are some simple steps to follow to get your dog toileting where they should, outside! If you have an adult dog that is toileting in the house check with your veterinarian to make sure there are no physical issues that could be causing the problem. If there is, no amount of training in the world can fix it. Once you get the all clear from your vet proceed to the next step. 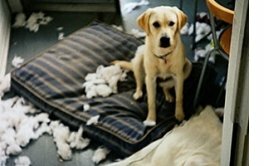 Are You Struggling with a Destructive Chewer? It’s normal for puppies and dogs to chew on objects as they explore the world. Chewing accomplishes a number of things for a dog. For young dogs, it’s a way to relieve pain that might be caused by incoming teeth. For older dogs, it’s nature’s way of keeping jaws strong and teeth clean. Chewing also combats boredom and can relieve mild anxiety or frustration. Read more here. Good Dog! Coaching & Pet Care has been awarded "Best of Gwinnett" for 2011, 2012 & 2013! Please help us reach our goal for 2014. Click the "Best of Gwinnett" link, click "Pets" on the left menu, down arrow under "Best Place to Board a Pet", select "Good Dog! 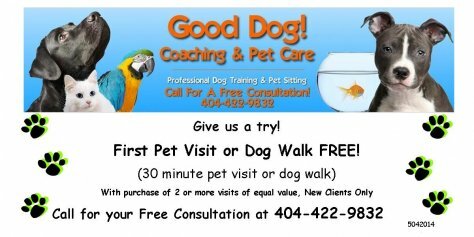 Coaching & Pet Care", then hit "save". That's it! Takes less than 2 minutes. Thank you!!!! What are Fleas andWhy are Your Dogs Susceptible to Them? Myla is a sassy little Pomeranian who is full of energy and loves to hop in your lap and give you kisses. She is excellent at the “sit” command, but prefers to come only when she is in the mood. Her mom just loves her to pieces as does anyone who meets her. met with Abbie before her assignment, I felt quite at ease that things would work out and they did. We will be out of town again soon, I'm sure all your sitters are excellent, but we would love to have Abbie again if possible, so that our cats can really get used to her. Thanks again for providing a really superior pet sitting service.